This is my receipt from my trip to Bruno's during their triple coupon promotion, honoring all coupons up to 55¢. Look closely. 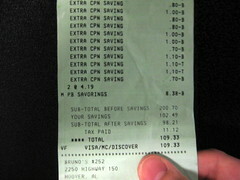 The sub-total before coupons was $200.70, and the sub-total after coupons was $98.21. That's more than $100 in savings! When I found out about the triple coupon deal, I sat at home and pulled out all the coupons up to 55¢ I could find in my organizer. Luckily, I hadn't yet gone through the Sunday coupon inserts from the last two weeks, so I had plenty to choose from. I even pulled out things that I normally wouldn't buy, because with discounts as much as $1.65, I knew I might be able to get some products for free (or close to it). I set out for Bruno's Monday morning at 6 a.m. while the girls were still asleep. With the pile of coupons I had, I knew my shopping would take a while, and they wouldn't have enjoyed the experience. Before starting though, I went inside and bought a Sunday paper still left over from the day before, then returned to my car to clip even more coupons. My trek through the store took me about 2½ hours because I wanted to be sure that I wasn't simply using a coupon for its own sake, so I'd figure out the math in my head (sometimes having to account for differences in product sizes). If the generic brand was still cheaper (as it often was), I'd skip it. In the end, I used a coupon for every single item I purchased. That amounted to 57 coupons for 78 items (because some were for "save x amount off of two"). The cashier was impressed. And to top it off, I brought my own bags with me to the store. Here's a picture of my full receipt, though you can't make out what's on it. It's official: My children will never have a birthday party at Chuck E. Cheese's. We were there this weekend for a cousin's first (yes, first) birthday party. Ugh, that place is horrible -- loud, overcrowded, and kinda smelly. Amazingly enough, the pizza wasn't bad, though. I thought it tasted just like Pizza Hut. Three or four (it was so crowded, I couldn't tell for sure) families shared the same small area for simultaneous birthday parties. None seemed to be granted enough room at their table for everyone in their group to sit down. Then at one point, Chuck E. himself came out in costume to dance and sing with the kids -- all parties simultaneously, mind you, so it was chaos. The song the employees sang had a line about "Who's your favorite mouse?," and in my head I was thinking, "Mickey... Jerry... Stewart Little... Ralph S... Mrs. Frisby... Speedy Gonzales... Mighty Mouse... Gus & Jaques... Bernard & Bianca... Pinky & the Brain... anyone but you, Chuck E."
I don't remember Chuck E. Cheese/Showbiz being so bad when I was a kid. Did it change, or am I just realizing it now that I'm grown up? Back then there was a ball crawl (today's kids could suffocate, break a leg, or throw up in there), strobe room (may cause seizures), lots more video games, and more animatronic characters. Of course, Emily loved it and is dying to go back. Today for Emily's actual birthday, we let her be queen for the day. This meant that she got to choose the day's activities -- cookies for breakfast, playing at Wald park, a pizza picnic, feeding the ducks, and a walk around Star Lake. Afterward, we enjoyed cake and ice cream that remained from Sunday's party. You might be surprised, but with a 5-year-old as head of the party planning committe, Emily came up with the makings for a pretty great day. Here are a few more pictures from our fun-filled outing. We survived Emily and Kendall's double birthday party extravaganza without incident. There was only one meltdown, and thankfully, it wasn't from either of our girls. I'm always uneasy about having so many people over at the house at one time, but everyone at the party seemed to enjoy themselves, and as a result, I did too. Combining the girls' birthday parties into a single event was a genius idea from Misty. It saved us money, of course, only having to buy balloons, cake, etc. once. But it also benefitted our families in only creating one day this month that they'd have to drive in from Cullman or Atlanta. We're likely at the last year that such a combined party will be possible, though. The girls thought it was great this time, but they'll grow out of that soon enough. Kendall was young enough this year not to realize that her party came 2½ weeks after her actual birthday (and of course, Emily wasn't going to complain that the party came two days early for her), but it wouldn't surprise me if next year Kendall balked at the idea of being put on hold. Plus, with Emily in school next year, she'll likely begin to want to invite more friends than family, so a combined party really would create too many people to handle. Misty and I enjoyed a rare treat of an evening out without the girls last night as we attended the opening production of Cirque Dreams: Jungle Fantasy at the BJCC. 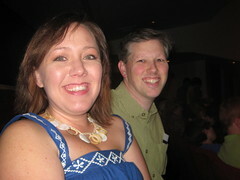 While it wasn't quite on par with Cirque du Soleil's shows, we had a great time and were in awe of the performance. You can read my full review in my blog on al.com. Afterward, we spent a few minutes outside the theatre chatting with our friends Nick and Regina who had joined us for the show. As new parents, they too seemed to be relishing the opportunity to be out of the house for a few hours. As we were about to leave, a guy introduced himself to me who had recognized me from my Twitter updates (which you should follow if you want more frequent updates than I post here). That was weird, but pretty cool, too. All the way home, Misty sang her own silly, improvised versions of the cheesy songs from Cirque Dreams. She made fun, but I think the music was her favorite part of the evening. Friday night I went to WorkPlay with my friend Chez to see Ben Kweller and The Watson Twins. I'm so excited about the videos I shot from the concert! The lighting was good and we were able to get really close to the stage. Here are a couple of my favorites, but you can find several more videos from the show in my Get On With Your Nightlife blog. It's the first day of March, and it's snowing! I'd heard news reports mention it a few times leading up to today, but I was still shocked this morning to wake up and find snow on the ground. There was a lot of it (for Birmingham, anyway) and it continued to fall heavily. Misty and I were supposed to lead a class during children's worship today, but luckily church was cancelled, so we got to go outside and play instead. I'm sure some people will bemoan the fact that by happening on a Sunday, the snow didn't keep anyone home from school or work, but I was glad to be home playing with my kids instead of sitting in front of the computer updating the news. The girls were, of course, thrilled about the snow. They got all bundled up for the occasion, and we headed outside. Emily immediately informed Kendall that you can eat snow, and after that Kendall wanted to do nothing more than put mittenfuls in her mouth. Here are several pictures from our brief adventure in the snow. As you can see, we managed to roll up enough snow in the front yard to build a snowman. It was funny watching Misty try to pack snow together by just building a pile instead of rolling it up in a ball, but she got the hang of it. We were ill prepared to decorate our frozen friend though, and we had to improvise in the construction of his expression. No corncob pipe or button nose here -- our snowman's eyes are fashioned from some candied cherries Misty found in the freezer; his nose is a cantaloupe slice; and his mouth was graciously donated by Mr. Potato Head. Even when Kendall and I went into the back yard (which was like a big, white, slushy mud puddle) to look for sticks, we couldn't find any and had to break some off the mimosa trees (they're like weeds anyway). For some reason, both girls decided to remove their mittens after a few minutes, so it didn't take long for them to begin pleading to go back inside. It was certainly fun while it lasted. I'm sure the snow will be gone by tomorrow -- which is perfect, I think.